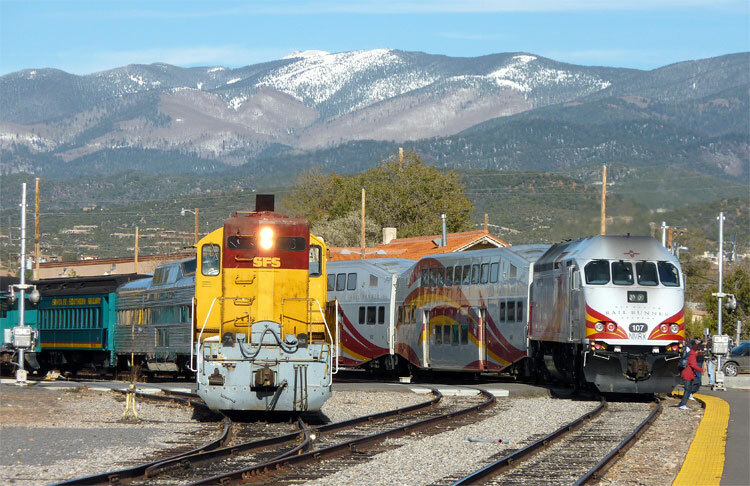 Travel by train has been a significant part of New Mexico’s history for over 100 years. Today, some people still prefer train travel than airplanes and car trips. The railroad allowsfor travellers to relax and enjoy the diverse scenery that New Mexico has to offer. While visiting, take advantage of some of the scenic railroad trips in the area. The SFSR is an 18-mile spur from Santa Fe to the small village of Lamy, NM. This short stretch connects to the Atchison, Topeka & Santa Fe line that is also operated by Amtrak. For visitors arriving by train, this connects with the Chicago-to Los Angeles and San Francisco lines. In addition to bringing up travelers from Lamy, the SFSR runs several scenic rides and freight trains throughout the year. The depot is located in the Guadalupe Shopping District of downtown Santa Fe. Visitors will notice the historic California mission-style building and board the vintage railcars from there. Passengers are surrounded by high-desert beauty on their relaxed trip to Lamy. SFSR also offers several special events trains during holidays. These trips often include live music and catering. Known as “America’s Longest and Highest Narrow Gauge Railroad”, the C&TS connects Chama, NM to Osier and Antonito, CO. The ride boasts an elevation change of over 2,000 feet, reaching its highest point of 10,015 feet in Cumbres, CO. The breathtaking trip winds through several valleys and mountains. On the trip, it is not uncommon to see antelope, eagles, bears, big horn sheep, and several other animals in their natural habitats. The train offers three classes of service allowing everyone from the budget-conscience traveller to the first class person to enjoy a day trip. The trips run from the end of May through October, seven days a week. Opened in December 2008, the NM Rail Runner provides passenger train service to and from Santa Fe and Albuquerque. Although the train does not directly connect to the Albuquerque Airport, there is a shuttle service that will deliver guests to the train depot. Travellers coming to Santa Fe will enjoy the scenery as they wind through various small villages and pueblos. The Rail Runner shares the downtown depot with the Santa Fe Southern Railway. Guests are only a few short blocks from the Plaza and several other attractions.